The original campaign was launched in 2005 with the Wandsworth Borough News, in response to growing calls for action from passionate Battersea people and the creeping use of the term ‘Clapham’ by mis-informed residents, developers and businesses in and around Clapham Junction, which is as we all know the Heart of Battersea!! The campaign was re-launched in 2007 since when it has had some notable successes and is continuing to gain wide support. The SW11tch Back to Battersea Campaign is dedicated to encouraging and spreading Love for Battersea. It now has a Facebook group "Love Battersea" that people are welcome to join and contribute to. However, we have found that Twitter has been a much more helpful way of connecting with the wonderful people and businesses of Battersea, and those around London, the UK and the world who once lived here or have a soft-spot with the place. The number of followers we have on twitter is increasing and they are generously providing us with active help with the campaign, spreading love in and knowledge of Battersea. More than that, they are showing just what a great community exists here. On Twitter we are "@LoveBattersea1". 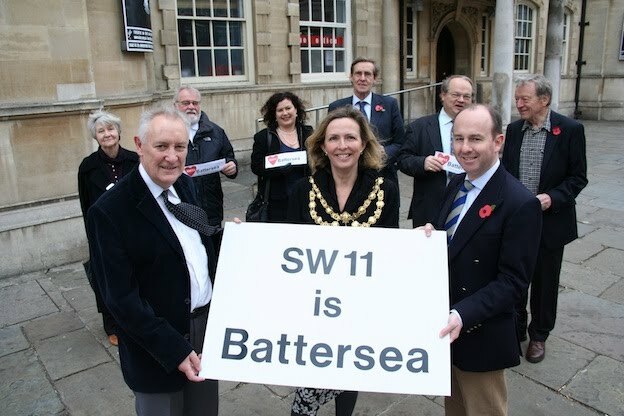 The re-launch of the SW11tch Back to Battersea Campaign was formally kicked off with a gathering of supporters on Saturday 10th November 2007 on the steps of Battersea Arts Centre....... Battersea's old Town Hall (see photo below). Pictured above at the re-launch - front row: Cllrs Tony Belton and Philip Beddows with the Deputy Mayor of Wandsworth Cllr Claire Clay. Back row left to right: Cynthia Newman, Harvey Heath (Sec. Battersea Society), former MP Martin Linton and the two distinguished Patrons of the campaign - John Bowis OBE MEP and Lord (Alf) Dubs of Battersea, former MPs for Battersea. Confusion continues in some quarters amongst residents (particularly ones who have moved to the area in recent years), businesses (like ASDA Clapham - now reincarnated as "ASDA Clapham Junction. Battersea - click to read story), and even some estate agents in Northcote Road (like Cluttons), and as we have found in the past year, the developers who wish to redevelop Clapham Junction station, but they have now SW11tched. 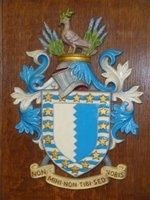 If you are reading this and live in SW11, around Clapham Junction, between Wandsworth and Clapham Common, or north of Clapham Common Northside to the eastern edge of the metalled road of Wix's Lane, then YOU LIVE IN BATTERSEA, part of the Borough of Wandsworth, and we'd like you to be proud to say so. You may ask ‘does this really matter’ – the answer is that it does. Battersea is dear to the hearts of many people and has a special character and identity of its own. Confusion over where a business or person is located chips away at the creation of a sense of community and identity with place. In Cities like London, people often comment about the lack of community feeling some places can have - knowing where one lives and feeling good about it rather than confused about whether it is Place A or Place B must be better than having no feeling for, or pride in where you live. Apart from that, Battersea is in the 'Brighter Borough' of Wandsworth, which gained its nick-name after comparison with a different Lambeth long ago. In particular, we are very proud of Clapham Junction being at the Heart of Battersea and want all to know and to be proud of this fact, despite the confusion of its name. 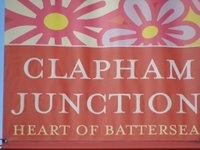 The older generations who were born and bred in Battersea know so well that Clapham Junction is in Battersea. It may be that the name "The Junction" came about from locals knowing full well that it wasn't Clapham. Today, the area experiences a large turnover in population and new residents have tended to be amongst the most confused over whether they live in Clapham or Battersea. This is one of the reasons the SW11tch campaign was launched - to educate people about where they live and promote a sense of pride in being in Battersea. As well as all of SW11 being in Battersea, so are parts of SW4 (like Clapham Common Northside and Westside) and SW8 (like the Queenstown Road diamond conservation area and Nine Elms). Also, parts of SW12 and SW17 - most of Bellevue Road is in Battersea and the nearby name of 'Boundaries Road' is no accident - a bit of Battersea just south across Ravenslea and Belleville Roads! In fact, the old historical boundary on Clapham Common runs from and including the west side of Wix's Lane, across the Common between the bandstand and the Cafe to the southern end of The Avenue - many will be surprised to find that the bandstand is a Battersea landmark and that the Battersea side of Clapham Common was historically known as 'Battersea East Heath', which explains the name 'Battersea Woods' being applied to the woodland area alongside The Avenue. Today what was once two commons is united as Clapham Common - a place shared and enjoyed by the people of Battersea and Clapham who live around it. The old 'Battersea West Heath' is approximately represented today by the majority of Wandsworth Common including all of the area between the railway line and Bolingbroke Grove. Clapham is another great place to live, and we love our neighbour Clapham very much. Pride in Clapham is just as strongly felt there as pride in Battersea is felt here - love both to your heart's desire, but lets make sure we all know which is which and where they are. After all, how can one love a place if one does not know where it is? No-one loves London thinking that it is Paris - both are great, but Londoners will tend to think London is that bit greater and vice versa. One could say that Clapham and Battersea are two old and beautiful varieties of tree that have grown alongside each other for so long that their branches have become a bit entwined - but despite this, they are still two trees with separate roots and different equally beautiful blossoms! So, if you live in a part of Battersea that you prefer to call Clapham, don't begrudge those of us who are proud to call it what it is - beautiful Battersea. We look forward to keeping you updated on our campaign as it develops. With wide-ranging and cross-political support we intend to take this campaign beyond the realms of the Borough News and make contact with residents, businesses and media outlets to restore pride in the name of Battersea, and fix SW11 in particular in everyone’s minds as being Battersea!